The physiological and pathological significance of the kallikrein-kinin system was recently explored extensively, resulting in a rapid accumulation of information regarding their potential importance. This publication provides an integrated picture of the latest information on the kallikrein- kinin system. It contains contributions from morphologists, geneticists, biochemists, pharmacologists, physiologists, and clinicians. 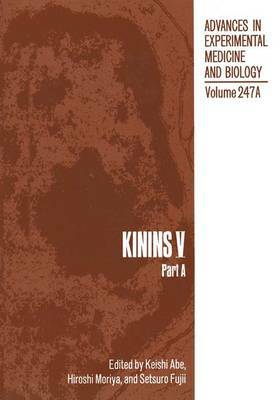 The Fifth International Kinin Congress (Nov. 29-Dec. 3, 1987) provided a forum for the exchange of information and ideas on the kallikrein-kinin system. The participation of more than 350 scientists from 23 countries reflects the widespread interest and international scope of research activity in the physiological and pathological functions of the kallikrein-kinin system. A total of 275 papers including posters were presented, attesting to the unquestioned success of this Congress. These proceedings, in two volumes, contain the collective studies presented, studies of high scientific standard that provoked stimulating and fruitful discussions. Also included in these volumes are the two plenary lectures presented by Dr. H.A. Margolius (USA) and Dr. S. Nakanishi (Japan). During the last decade our knowledge of the role of the kallikrein- kinin system in health and disease has been greatly advanced by the develop- ment of antagonists to bradykinin and the introduction to clinical practice of converting enzyme inhibitors. Symposia on converting enzyme and on recent advances in research on the kallikrein-kinin system are included in the proceedings.